London - Manchester City swept back to the top of the table with a stylish 2-0 win at Fulham, while Huddersfield equalled the record for the earliest Premier League relegation after defeat at Crystal Palace on Saturday. Amid the drama at the top and bottom, Manchester United celebrated Ole Gunnar Solskjaer's first match as permanent manager with a 2-1 win over Watford to climb into fourth place. Bernardo Silva's fifth-minute strike from the edge of the area was followed by Sergio Aguero's cool finish as City effectively wrapped up the points in the first 27 minutes. City lead Liverpool by one point with seven games remaining for both sides, but Jurgen Klopp's men can regain pole position with victory over third-placed Tottenham at Anfield on Sunday. Pep Guardiola's side remain on course for an unprecedented quadruple of Premier League, Champions League, FA Cup and League Cup, which they retained last month. "The way we started was amazing. They surprised me again, the first 15-20 minutes was exceptional," Guardiola said. "Every game we have to win if we want to be champions. We have tough opponents, but that is the challenge." 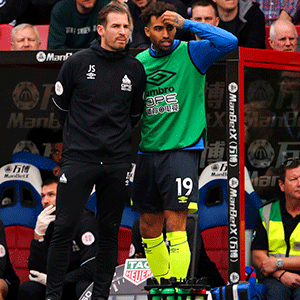 Bottom-of-the-table Huddersfield's two-season stay in the top flight came to an end at Selhurst Park as they slumped to a 24th defeat in 32 league games by losing 2-0 at Palace. Already destined for the drop, Jan Siewert's side had their fate sealed due to their result and wins for Burnley and Southampton. Luka Milivojevic's 76th-minute penalty put Huddersfield behind after a foul on Palace winger Wilfried Zaha. Patrick van Aanholt's 88th-minute strike pushed the bedraggled Terriers back to the Championship. "It is hard to say what I am feeling, disappointment of course. It sums the season up that a penalty decides the direction. I haven't counted but we've conceded maybe eight to 10 penalties this season," Siewert said. "For me in life there is failure and success and it belongs together. After successive defeats against Arsenal and Wolves before the international break, Anthony Martial ensured United got back on track when he bundled home in the 72nd minute despite Watford's appeals for offside. Sean Dyche's side took the lead in the second minute when Chris Wood's shot hit a post and deflected off Conor Coady for the Wolves' defender's third own goal this season. Dwight McNeil netted in the 77th minute to improve Burnley's chances of survival. Pierre-Emile Hojbjerg chipped in from Nathan Redmond's pass in the 53rd minute to leave Saints five points clear of third-bottom Cardiff, who face Chelsea on Sunday. Leicester beat Bournemouth 2-0 with goals from Wes Morgan and Jamie Vardy.